Many historical references to the paranasal sinuses exist. The earliest such reference can be dated back to the works of Galen, who described the presence of the ethmoid air cells. Later descriptions of the maxillary sinuses by Leonardo da Vinci (1489), the sphenoid sinuses by Giacomo Berengario da Carpi (1521), and the frontal sinuses by Coiter (16th century) introduced early anatomists and scholars to the presence of these craniofacial air cells. The first modern and accurate descriptions of the paranasal sinuses can be traced to the works of the late 19th century Austrian anatomist Emil Zuckerkandl. His detailed study and illustrations of the paranasal sinuses set the standard for generations of anatomists and physicians. Countless 19th and 20th century anatomists, radiologists, and surgeons have further contributed to advancing the knowledge of sinus anatomy (see the image below). The introduction of computed tomography (CT) and the wider use of it in the last 20 years have further contributed to the physician's ability to appreciate nuances of paranasal sinus anatomy and accurate disease correlation. Ostiomeatal unit line drawing: inferior turbinate (1), middle turbinate (2), maxillary sinus (M), uncinate (U), ethmoidal bulla (B), frontal sinus (F), ethmoidal infundibulum (INF), nasal septum (NS), and middle meatus (*). The introduction of head and neck CT imaging and the current wider use of this modality have undoubtedly helped the clinician. CT has become a useful diagnostic modality in the evaluation of the paranasal sinuses and an integral part of surgical planning. It is also used to create intraoperative road maps. Today, CT is the radiologic examination of choice in evaluating the paranasal sinuses of a patient with sinusitis. The use of CT scanning combined with functional endoscopic sinus surgery (FESS) has empowered the modern sinus surgeon to treat patients more effectively, facilitating reduced morbidity and complications. Physicians who are interested in treating patients with sinus disease must be able to read and interpret sinus CT scans. Mastery of sinus anatomy and its variant features forms the basis from which radiologic interpretation begins. Familiarization with the radiologic landmarks and cross-sectional anatomy on patient CT scans, along with clinical correlation, can further enhance the reader's ability to understand sinus CT findings. With experience, CT findings can be accurately correlated with the anatomic and clinical realities of the particular patient. As in all radiologic surveys, sinus CT scans must be read with a systematic approach. In addition to reviewing the scan to determine the presence of disease, CT scans of the sinuses can also be reviewed to evaluate potential areas of occlusion and variations of the patient's sinus anatomy in the setting of surgical planning. For excellent patient education resources, see eMedicineHealth's patient education article CT Scan. The use of intravenous contrast material just prior to scanning can help define soft tissue lesions and delineate vascularized structures, such as vascular tumors. Contrast-enhanced CT is particularly useful in evaluating neoplastic, chronic, and inflammatory processes. 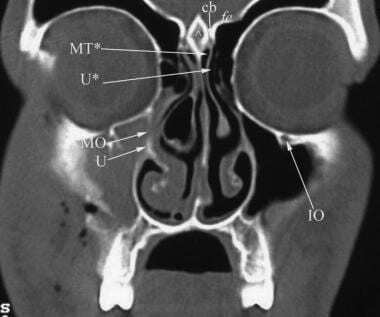 However, for most patients with sinusitis, noncontrast CT of the paranasal sinuses generally suffices. For patients who may not tolerate the prone position required for coronal cuts, computer-generated reconstructed coronal views can be generated from thin axial sections. If sufficiently thin axial sections (1-2 mm) are available, sagittal reconstructions can also be helpful for teaching purposes and further delineating anatomic structures. Proper positioning of the patient's head is important to obtain CT images. For axial views, the patient's hard palate is placed perpendicular to the CT scanner table. The images must be captured such that the external auditory canal is in line with the inferior orbital rim. The coronal images are taken so that the gantry is perpendicular to the patient's hard palate. Misalignment or rotation can lead to distortion of the true anatomy on the films. Sinus CT is used in correlation with clinical examination procedures, including nasal endoscopy. Combined, the information gathered determines the extent of disease and forms the basis of the treatment plan. The timing of CT scanning can have a significant impact on the correlation of CT findings with actual disease state. The diagnostic yield of the scan for detecting irreversible (surgically treatable) disease processes, such as chronic disease or structural problems, is increased once acute or reversible problems are treated. As such, CT scans should be obtained only after acute sinusitis episodes have been adequately treated. Changes from acute infections can last several weeks; waiting for at least 6 weeks before obtaining a scan is recommended to determine the patient's baseline disease status. Patients with chronic inflammatory disease, such as strong allergies and/or sinonasal polyposis disease, should receive maximized medical therapy for a few weeks before undergoing CT scanning. Depending on the patient's problems, this therapy may include antihistamines, nasal steroid sprays, antibiotics, or a brief course of oral steroids. Some patients may be referred for evaluation after the discovery of radiologic disease on a screening CT scan. 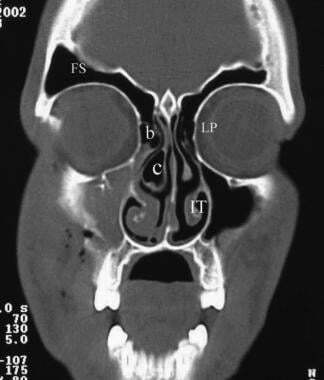 These screening sinus CT scans often only include thicker (5-10 mm) axial cross sections of the paranasal sinuses. They can help to establish disease diagnosis in a more cost-effective manner. One may argue against these so-called screening CT scans because of the superior diagnostic yield of properly obtained axial and coronal sections and the eventual need for coronal sections before surgery in some patients. Moreover, because the cost of CT scanning today is significantly reduced compared to that even a decade ago, complete CT is perhaps a more cost-effective test than screening CT, with a one-time order of a complete CT scan providing much more diagnostic and surgical usefulness. The osseocartilaginous septum forms the medial extent of the nasal cavity, and deviations in its position can be of clinical significance. 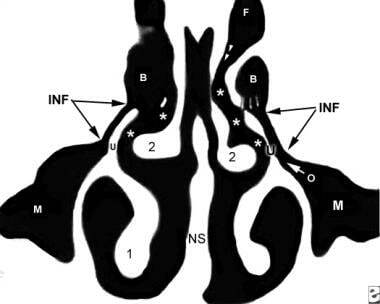 The inferior turbinate extends along the inferior lateral nasal wall posteriorly toward the nasopharynx. In patients with a significant allergic component to their symptoms, the inferior turbinates may be enlarged. Enlarged turbinates may be obscured on CT scanning and should be correlated with physical examination findings. The nasolacrimal duct (NLD) opens into the inferior meatus underneath the inferior turbinate. The NLD drains the lacrimal sac and runs within a bony canal formed by the maxilla, lacrimal apparatus, and inferior turbinate bones. Because of this location, a large duct can be mistaken for obstruction within the ostiomeatal unit. The middle turbinate has 3 anatomic parts and is a key landmark in endoscopic sinus surgery. The anterior third courses vertically, lying in the sagittal plane, running from posterior to anterior. Superiorly, the middle turbinate attaches to the skull base at the lamina cribrosa of the cribriform plate. The middle third turns coronally and laterally to insert on the lamina papyracea. The coronal component of the middle turbinate is referred to as the basal lamella, and it represents the dividing point between the anterior and posterior ethmoid air cells. The posterior portion of the middle turbinate becomes horizontal and posteroinferiorly attaches to the lateral nasal wall. This hook-shaped bone of the lateral nasal wall forms the anterior border of the ethmoid infundibulum, which leads to the natural ostium of the maxillary sinus. Anteriorly, the uncinate process attaches to the lacrimal bone, and inferiorly, the uncinate process attaches to the ethmoidal process of the inferior turbinate. The posterior edge lies in the hiatus semilunaris inferioris. Superiorly, the uncinate process may attach to the middle turbinate, the lamina papyracea, and/or the skull base. See the image below. Coronal view demonstrating the blockage of the ostiomeatal complex by a large concha bullosa (CB). Important components of the ostiomeatal complex that can be seen include the uncinate process (U) and maxillary sinus ostium (MO). The attachments of the middle turbinate (MT*) to the cribriform plate (cb) and of the uncinate process (U*) to the skull base can be appreciated. The fovea ethmoidalis (fv) and crista galli (^) can also be seen. Image used with permission from A. John Vartanian, MD. The ethmoid sinus consists of approximately 7-15 cells with a variable pneumatization pattern. The ethmoid bulla is the most constant landmark and forms the most anterior ethmoidal air cell. The lateral extent of the bulla is formed by the lamina papyracea. The basal lamella of the middle turbinate separates the anterior ethmoid cells from the posterior ethmoid cells. Anterior ethmoid cells drain into the middle meatus, while posterior cells drain into the superior meatus. The anterior ethmoid cells are an important part of the ostiomeatal unit. Obstruction here can also affect frontal and maxillary sinus drainage. Other cells that may originate from the ethmoid cell development include frontal cells, supraorbital ethmoid cells, infraorbital cells (ie, Haller cells), and sphenoethmoid cells (ie, Onodi cells). The suprabullar recess is a potential air space that can exist between the ethmoid bulla and the skull base. The sphenoid sinus is the most posterior paranasal sinus. It is found superior to the nasopharynx, just anterior and inferior to the sella turcica and posterior to the posterior ethmoid cells. The sphenoid ostium can be seen medial to the superior turbinate and posterior to the basal lamella. An intersphenoid septum variably divides the sphenoid into 2 air cells. Several important structures are related to the sphenoid sinus. The internal carotid artery is typically found at the posterolateral wall of the sphenoid sinus. In up to 22% of cases, this bony covering may be dehiscent. The optic nerve and its bony encasement produce an anterosuperior indentation within the roof of the sphenoid sinus. In 4% of cases, the bone surrounding the optic nerve is dehiscent. See the image below. 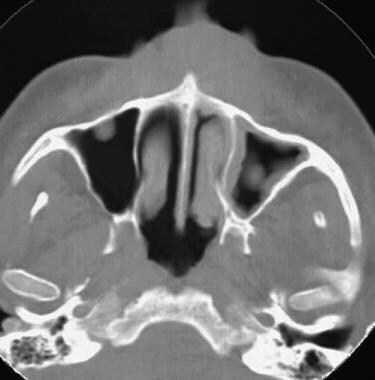 Close-up coronal view of the sphenoid sinus with dehiscence of the sellar floor. Image used with permission from A. John Vartanian, MD. CT scanning can be helpful in the diagnosis of acute and chronic sinusitis, neoplastic and inflammatory processes, and other problems (eg, congenital anomalies). In chronic sinusitis, repeated episodes of acute sinusitis or festering infection usually combined with unfavorable anatomic factors lead to a vicious cycle of infection, mucociliary incompetence, and chronic mucosal inflammation. CT findings suggestive of chronic sinusitis include mucosal thickening, opacified air cells, bony remodeling, and bony thickening due to inflammatory osteitis of the sinus cavity walls. Bony erosion can occur in severe cases, especially if associated with massive polyps or mucoceles. CT findings of bony destruction should alert the clinician to also consider less common diseases, such as sinonasal tumors or granulomatous disease processes. See the image below. Axial image at the level of the inferior turbinates demonstrating maxillary mucoceles and mucosal thickening, especially in the right maxillary sinus. Image used with permission from A. John Vartanian, MD. Axial images of the anterior and posterior ethmoid air cells. The presence of massive sinonasal polyps was confirmed by intraoperative findings. Image used with permission from A. John Vartanian, MD. Fungal sinusitis can be divided into invasive fungal sinusitis, chronic noninvasive fungal sinusitis (mycetoma), and allergic fungal sinusitis. Invasive fungal sinusitis due to mucormycosis or aspergillosis is typically a disease that affects immunocompromised patients and can have a fulminant course. Early in the disease process, opacification of sinuses is seen. Disease progression to a more fulminant state accompanies vascular invasion and localized destruction. Intracranial, cavernous sinus, and orbital complications may occur with advanced infections. CT findings mirror these processes with expanding localized destruction of bone. Mycetomas appear inside the sinus cavity as noninvasive balls of fungus. CT findings may include a localized sinus opacification, homogenous mass that does not change shape with head position (gravity), and a mass with presence of calcifications (found in 25% of cases). Allergic fungal sinusitis (AFS) may occur in atopic patients as a hypersensitivity reaction to fungal antigens. Many patients with AFS may also have various degrees of nasal polyposis. On CT scans, heterogeneous opacification can be seen with a typical pattern of central hyperdense areas of opacification surrounded by less dense areas of opacification. Calcified areas can sometimes be seen. Bony expansion, remodeling, and even diffuse bony destruction can be seen in advanced cases. With experience, CT findings can be accurately correlated with anatomic and clinical realities of the particular patient. As for all radiologic surveys, sinus CT scans must be read with a systematic approach. After the primary survey of the CT scan is completed, including patient name, indications for the CT scan, type of scan, cross-sectional view being discussed, and major radiologic findings, particular attention is directed toward potential "bottle-neck" areas, where normal passages may be occluded by disease states or variant anatomy. A systematic approach is helpful when interpreting CT scans. Reading the CT scan from anterior to posterior (on coronal views) or from top to bottom (on axial sections) can help organize one's approach in analyzing structures to be interpreted. For initial orientation, a number of important paranasal sinus structures are identified, including the frontal sinuses, the frontal recess, the agger nasi cells, the anterior ethmoidal sinus cells, the ethmoid roof, the ethmoidal bulla, the uncinate process, the ethmoidal infundibulum, the maxillary sinus, the middle meatus, the nasal septum, the turbinates, the basal lamella, the posterior and anterior ethmoid cells, and the sphenoid sinus. See the image below. Coronal view demonstrating well-pneumatized frontal sinuses (FS), the ethmoid bulla (b), and the lamina papyracea (LP). Also of interest is the presence of an aerated middle turbinate or concha bullosa (c) blocking the ostiomeatal complex. The inferior turbinate is labeled IT. Image used with permission from A. John Vartanian, MD. If the CT scan is being read as a prelude to surgery, a number of additional anatomic and structural features need to be considered. The thickness, orientation, and most medial position of the lamina papyracea must be noted. Any dehiscences or excessive medial bowing of this thin bone should be noted prior to surgery. Similarly, the depth of the olfactory fossa must be recognized. The relationship of the sphenoid sinus and posterior ethmoid air cells vis a vis the internal carotid artery and optic nerves should be noted. Depth of the olfactory fossa: The deeper the fossa (ie, increased distance from the cribriform plate and the fovea ethmoidalis), the higher the chance for fracture or perforation with surgical maneuvers. The prevalence of intracranial penetration during FESS is higher when this anatomic variation occurs. Intracranial penetration is more likely to occur on the side with the lower roof. Axial images of the anterior (ae) and posterior (pe) ethmoid air cells. The sphenoid sinus (sp) can be seen with its intersinus septum. Image used with permission from A. John Vartanian, MD. Agger nasi: This is a bony prominence that is often pneumatized in the ascending process of the maxilla. Its location below the frontal sinus also defines the anterior limit of the frontal recess. Concha bullosa: The concha bullosa is a pneumatized middle turbinate. An enlarged middle turbinate may obstruct the middle meatus and the infundibulum causing recurrent disease. It may also serve as a focal area of sinus disease. Ethmoidal bulla: This is the largest and most anterior ethmoid cell system. It is found posterior to the middle turbinate and posteromedial to the uncinate process. Ethmoidal infundibulum: This is a space bordered medially by the uncinate process and laterally by the lamina papyracea. The maxillary sinus ostium is found inferiorly and laterally within this space. Haller cell (infraorbital cell): The Haller cell is usually situated below the orbit in the roof of the maxillary sinus. It is a pneumatized ethmoid cell that projects along the medial roof of the maxillary sinus. Enlarged Haller cells may contribute to narrowing of the ethmoidal infundibulum and recurrent sinus disease, despite previous (incomplete) surgery. Frontal recess: This is an hourglass-shaped space between the inferomedial aspect of the frontal sinus and the anterior middle meatus. Unfavorable variations of the structures that define its borders may cause problems with the frontal sinus outflow tract. These structures include the agger nasi cell, supraorbital ethmoid cells, the ethmoid bulla, and inferiorly, the uncinate process. Lamina papyracea: This is a thin, bony wall separating the orbit from the ethmoid air cells. Dehiscences may occur for congenital reasons or because of previous surgery or facial trauma. Maxillary sinus ostium: This is the opening of the maxillary sinus to the nasal cavity and a part of the ostiomeatal complex. Ostiomeatal complex or unit: This term refers to a collection of middle meatal structures and is not a discrete anatomic entity. It consists of the ethmoid infundibulum, anterior ethmoid cells, and the uncinate process. It also represents the final common pathway of drainage for the frontal, maxillary, and anterior ethmoid cells. A patent ostiomeatal complex is essential for the improvement of patients with sinus disease. Paradoxical middle turbinate: The major curvature of the middle turbinate may project laterally, leading to narrowing of the middle meatus. Sphenoethmoid cell (Onodi cell): This is formed by lateral and posterior pneumatization of the most posterior ethmoid cells over the sphenoid sinus. The presence of Onodi cells increases the chance that the optic nerve and/or carotid artery would be exposed (or nearly exposed) in the pneumatized cell. Uncinate process: This is a 3-dimensional sickle-shaped (also described as a hook- or L-shaped) bone of the lateral nasal wall. Anteriorly, the uncinate process attaches to the lacrimal bone; inferiorly, the uncinate process attaches to the ethmoidal process of the inferior turbinate. The posterior edge lies in the hiatus semilunaris inferioris. Superiorly, the uncinate process may attach to the middle turbinate, lamina papyracea, and/or the skull base. In general, the larger the air cells, the thinner the bony walls become. 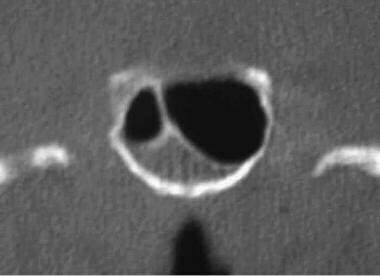 This may increase the chance for injuring structures within or adjacent to such bony structures lining the air cell. On CT scan, AFS is depicted as a heterogenous opacification that can be seen with a typical pattern of central hyperdense areas of opacification surrounded by less dense areas of opacification. Unilateral sinonasal polypoid soft tissue masses in the area of the ethmoid cells may represent a herniated encephalocele. An MRI may be helpful in its differentiation. Cebula M, Danielak-Nowak M, Modlinska S. Impact of Window Computed Tomography (CT) Parameters on Measurement of Inflammatory Changes in Paranasal Sinuses. Pol J Radiol. 2017. 82:567-70. [Medline]. [Full Text]. Yousem DM. Imaging of sinonasal inflammatory disease. Radiology. 1993 Aug. 188(2):303-14. [Medline]. Aksoy EA, Ozden SU, Karaarslan E, et al. Reliability of high-pitch ultra-low-dose paranasal sinus computed tomography for evaluating paranasal sinus anatomy and sinus disease. J Craniofac Surg. 2014 Sep. 25(5):1801-4. [Medline]. Pirimoglu B, Sade R, Sakat MS, Ogul H, Levent A, Kantarci M. Low-Dose Noncontrast Examination of the Paranasal Sinuses Using Volumetric Computed Tomography. J Comput Assist Tomogr. 2018 May/Jun. 42 (3):482-6. [Medline]. Al Abduwani J, ZilinSkiene L, Colley S, Ahmed S. Cone beam CT paranasal sinuses versus standard multidetector and low dose multidetector CT studies. Am J Otolaryngol. 2016 Jan-Feb. 37 (1):59-64. [Medline]. Tomovic S, Esmaeili A, Chan NJ, Choudhry OJ, Shukla PA, Liu JK, et al. High-resolution computed tomography analysis of the prevalence of Onodi cells. Laryngoscope. 2012 Jul. 122(7):1470-3. [Medline]. Minni A, Messineo D, Attanasio G, Pianura E, D'Ambrosio F. 3D cone beam (CBCT) in evaluation of frontal recess: findings in youth population. Eur Rev Med Pharmacol Sci. 2012 Jul. 16(7):912-8. [Medline]. Chakravarti A, Naglot S, Dhawan R. Outcome of endoscopic sinus surgery in patients with symptomatic chronic rhinosinusitis with minimal changes on computerised tomography. Indian J Otolaryngol Head Neck Surg. 2011 Oct. 63(4):359-63. [Medline]. [Full Text]. 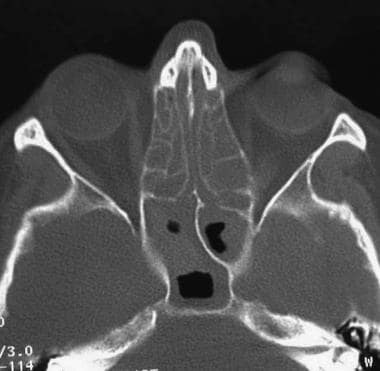 Coronal view of the anterior frontal sinuses demonstrating osteomyelitis of the frontal bone and autotrephination (arrow) of the outer table in a patient with a Pott's puffy tumor. Image used with permission from A. John Vartanian, MD. 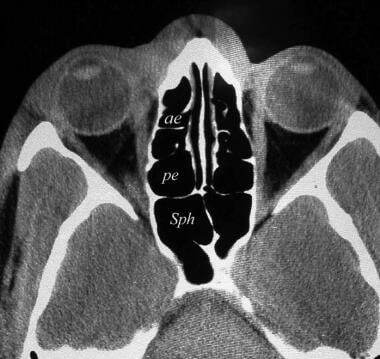 Axial view demonstrating opacification of the anterior and posterior ethmoid cells, mucosal thickening in the right aspect of sphenoid, and dehiscent petrous carotid canals (arrow) at the level of the sphenoid sinus. Image used with permission from A. John Vartanian, MD. The authors and editors of Medscape Reference gratefully acknowledge the contributions of previous author Stephanie Joe, MD, FACS, to the development and writing of this article.